Are you thinking about collecting rain in barrels? If you get 10-inches of rain and have a roof with 1,300 square feet, you would yield over 8,000 gallons of rainwater for your use. You have nothing to lose by collecting some of this free resource! Make the most out of your home’s available resources by investing in a rain barrel to collect runoff and water. Do a world of good by making the most of a resource that occurs naturally! What is your reasoning for buying a rain barrel? Reap the benefits of this purchase and get the right product for your space with our rain barrel buying guide. Before you buy your barrel pay attention to the material of the barrel, your size needs, and the appearance of the product. Collect rainwater to nourish your garden, reduce runoff pollution, and even reduce your water bill. Instead of the standard barrel that used to be your only option, companies are releasing stylish, functional, and carefully made rain barrels. For tiny house lovers and RV owners, a rain barrel provides the water you need for outdoor spaces and non-potable uses. If you are committed to a smaller footprint, harvest rainwater by collecting it in a rain barrel. No matter what option you purchase (and especially if you select one of our five best), you’ll reap the benefits of owning a rain barrel. Note: If you are going to be drinking straight from your water source, you may want to consider water purification prior to consuming - to ensure it is safe to drink! Everyone knows the traditional material for barrels is wood. Catching rainwater is a different type of production though – so you won’t see wood barrels on this list. Products on our list are now made from durable materials since they require withstanding weather year-round. ​For example, wood is a recyclable material used in older barrels but it isn’t common in the best options now. Metals for more permanent rain storage solutions but not as moldable to residential style requirements. Polyethylene or plastic is moldable in all shapes and colors without a high cost. Stone is a traditional material which is best for small amounts of rain. Before you make a decision about your purchase, make sure the size you purchase will fit your needs. Use this rainfall harvest calculator to see how many gallons of what you can collect based on factors like your roof size, sections that drain into your barrel, and the average rainfall in your area. Consider factors like: the amount of water your plants need, the average temperature in your area, planned uses for your water tank, and your price limit. You might find yourself able to collect rain faster than you realize! Aside from the material your rain barrel is made from, consider its appearance. For example, options on our list look like terracotta, stone, and even authentic rain barrels. The actual material it is made from is so different than the appearance. The appearance of the rain barrel should be a consideration so it compliments your home’s exterior. There are browns, blacks, blues, grays, and colors to suit every preference. Another factor in the rain barrel selection process is its shape. Don’t be afraid to explore varying shapes, heights, and dimensions. The pottery-like texture looks like a real terracotta pot and is available in gray and dark brown if terracotta isn’t your preference. With a full barrel, you get a minimum supply of emergency water for 14 days. The 55-gallon capacity provides water for light personal sanitation, drinking, and cooking to support four people. This high capacity rain barrel holds 75 gallons of water which is more than most options on the market. The Good Ideas barrel is available in five colors, including an oak appearance. It’s flat-backed design lets you pull the barrel up to your house. The dual-spigots on this water barrel make all of the difference in the functionality of this solution. Water your garden and up your home’s sustainability with the purchase of one of the five best rain barrels on the market. With a number of price points and stylistic options available, it gets tough to decide what you want to purchase. Our list considers factors for almost every consumer . Collect rainwater with a stylish barrel like the Algreen Cascata. Not only is this a high-quality product, it looks beautiful on the exterior of your home. Equipped with a high-quality spigot, you never experience an issue with functionality when you need the rainwater. The top of the rain barrel comes with a convenient planter so your barrel looks beautiful with constant blooms as well. One of the reasons we love this product is the way it looks. It does not appear plastic so it looks good but doesn’t cost too much. In addition, the plastic exterior comes to your advantage because it doesn’t chip, fade, or crack. Want a no-frills solution to your emergency water needs? Off-the-grid living is made possible through a series of decisions, one of which involves water. You have nothing to lose by collecting water to use in an emergency or even on a regular basis. The Emergency Essentials Water Barrel’s 55-gallon capacity provides enough water for cooking, drinking, and light personal sanitation for a family of four. Emergency water might be the most important asset you have in cases of emergency. Thanks to the dark blue color of the rain barrel, algae and bacteria growth gets discouraged. Don’t waste money on style when your personal needs all relate to functionality. Connect this rain barrel to a soaker hose or a garden hose if you want to irrigate your lawn. The Koolscape RBSS-75 Rain Barrel has a capacity of 75 gallons. We love this product because it really does provide you with a way to harness all of that rainwater and make it work for you. Even though the material of the barrel is plastic, it has a heavy base that is balanced for keeping it stable. The unit comes with a crown planter that has a double wall for durability. Try out this BPA-free barrel with a corrosion proof screen for your gardening, lawn watering, washing, and other non-potable water needs. Reap the advantages of plastic as your material with the appearance of a traditional oak barrel with the Good Ideas RW40-Oak Rain Wizard Barrel. The barrel will not fade for years and it is made of UV resistant resin to extend its lifetime. With a 40-gallon capacity, the Good Ideas product is not one of the largest options on the list but it serves the needs of a casual gardener. The color options available with this product are black, green, khaki, oak, and terracotta. Why not select a stylish and sustainable solution for your home? The Good Ideas RW40-Oak Rain Wizard Barrel pays for itself after you use it for a few seasons. Good Ideas Nantucket Rain Saver Rain Barrel comes with a wicker finish that looks classic and stylish, whether it is sitting around the pool or in your side yard. The rain barrel has a 50-gallon capacity and is made to be weather-resistant. You’ll love the two spigots on the barrel that are easy to open up. In addition, the brass on the spigots does not rust. ​The dual-spigots on this water barrel make all of the difference in the functionality of this solution. No matter the size of your property, collect water and increase the efficiency of your space with a water barrel purchase. With prices below $100 in some sizes, you don’t need to overspend on this product. Commit fully to your off-the-grid existence, or at the very least increase your sustainable decisions, with a water barrel. 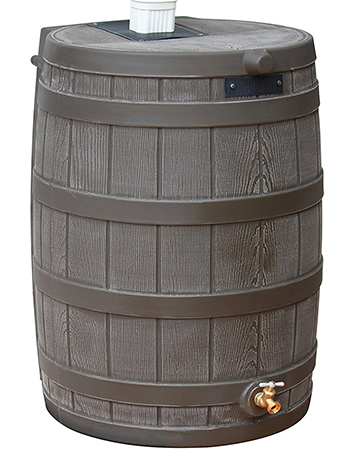 Our favorite just might be the Good Ideas RW40-Oak Rain Wizard Barrel.